We are in for a great month. It’s not October… it’s Arachtober. It’s a month to celebrate all things Arachnid, from photos, to blog posts and stories about our eight-legged friends. It’s a month to appreciate Arachnids for what they are: stunningly beautiful animals. First, do check out Africa Gomez’s blog – she’s promised to do daily (yes, DAILY) posts about spiders. Yay! 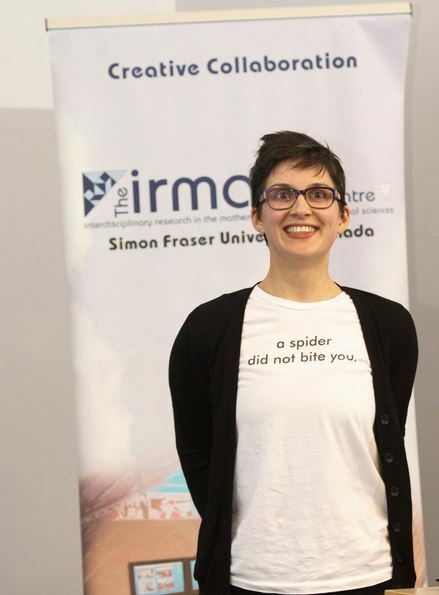 Be sure to follow Catherine Scott – she is on a terrific campaign to help educate people about spiders, and calm down the nerves and assure folks that the spiders they find are *not* brown recluse spiders. This is Catherine Scott, wearing a t-shirt with an important message. Be sure to keep an eye on the Arachtober Flickr group. Amazing photos to be found there; this was the first place that Arachtober got started… members of that group tried to post new spider photos daily, throughout the month of October. If you want to find other Archnologists on Twitter, here’s a Twitter List for you. Want to learn more about Arachnology? Check out the American Arachnological Society, or the International Society of Arachnology. Here’s a more general post about what to do if you want to be an arachnologist. Arachnology has a rich and fascinating history. The Biodiversity Heritage Library is a wonderful resource: here, you can look at old titles about spiders and on their Flickr page, view stunning plates from those old books and journals. Have a read through these great Arachtober posts from the past, from Bug Gwen. Another great blog to check out, for wonderful spider natural history, comes from “Bug Eric”. Have a spider and not sure what it is? Sometimes you can surf around on BugGuide and work towards an identification with that. It’s a great resource for Arachnophiles. Arachtober ends with Halloween, of course. Perhaps viewing some movies featuring spiders is a fine idea. So, how else will you celebrate Arachtober? Share your thoughts in the comment section, below! I love spiders (and have some in amber, millions of years old).